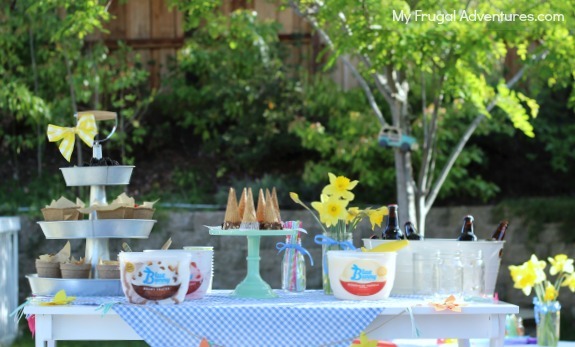 We recently had a fun and casual ice cream party to celebrate the arrival of Spring! 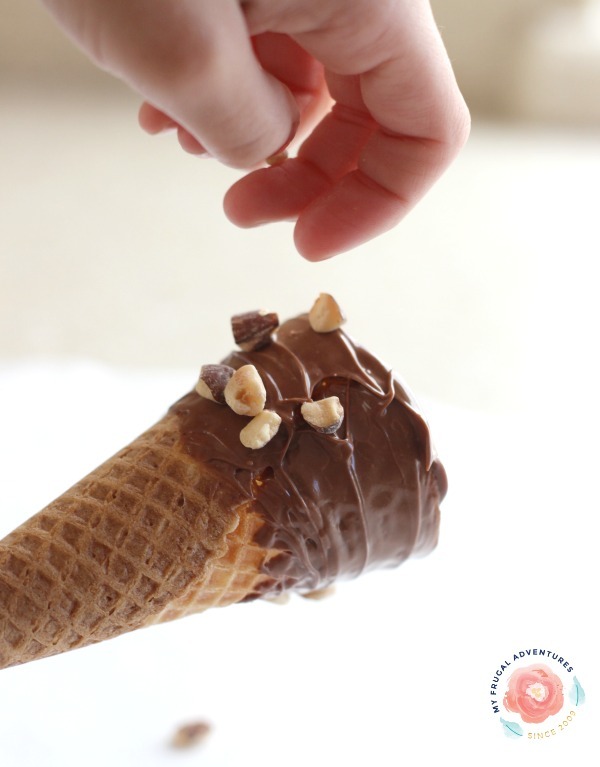 I thought I’d share some ideas from our party and a fun recipe for dipped ice cream cones. I have to say this was a pretty simple party to put together and it was so much fun! Last year for my daughter’s birthday we did ice cream instead of birthday cake. It was pretty stress free and the kids absolutely loved it. I find myself not entertaining as often as I’d like because it seems like so much work, a big expense and on and on. This year I am trying to do a lot more entertaining and just not stress myself out about it. My friends don’t care if the house isn’t perfectly spotless and if everything isn’t totally homemade and super gourmet. In fact, I think people are more at ease with casual parties and it gives me time to relax and enjoy our loved ones rather then running around worrying about a million decorations and a fancy menu. 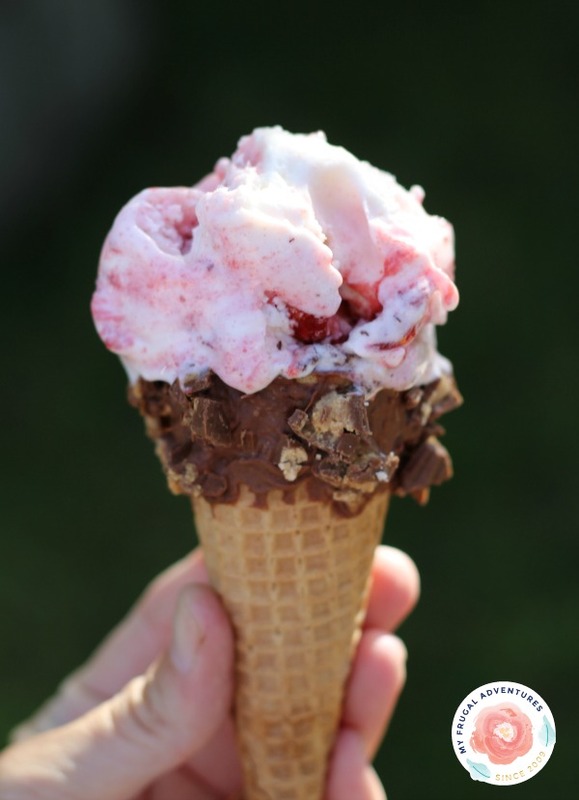 So I wanted to encourage you to try a simple ice cream party for Spring or maybe file this away for the first day of summer vacation! Everyone had a fantastic time and it only took me about an hour to prepare all the food. Totally manageable for a casual backyard get-together this summer. If you have kids in sports this would be such a fun end of season or start of season party! My daughter plays soccer and I am going to speak with the Coach about doing something like this at the park in May when they start practices. I did a Spring/Gardening theme with this party which was fantastic because I was able to use many things we already had on hand. The main focus of the party was ice cream but I wanted a few other snacks as well. 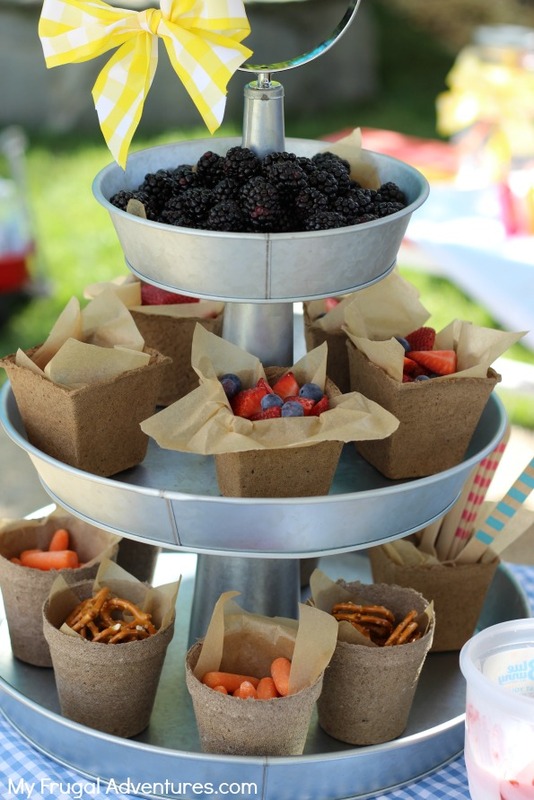 I used some seed starter cups to hold veggie and fruit cups and pretzels. 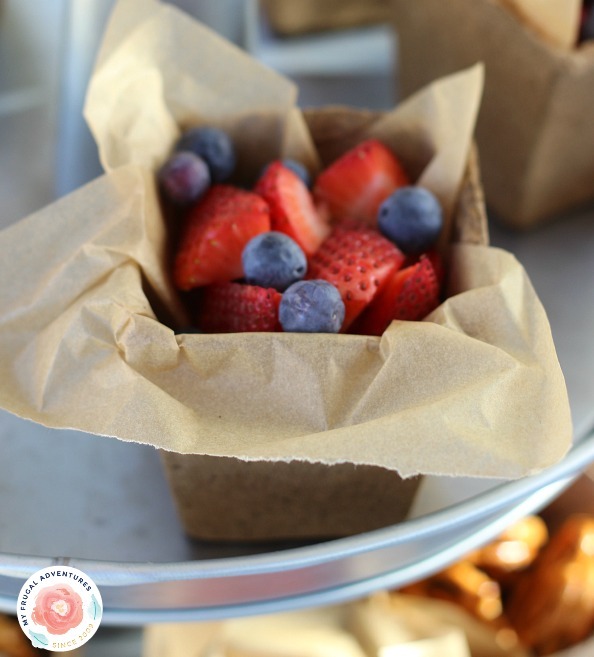 I just lined them with parchment and it was so simple and easy to grab a cup and continue to walk around the party. The cups were a perfect size for little people to manage. And the star of the party was the ice cream. 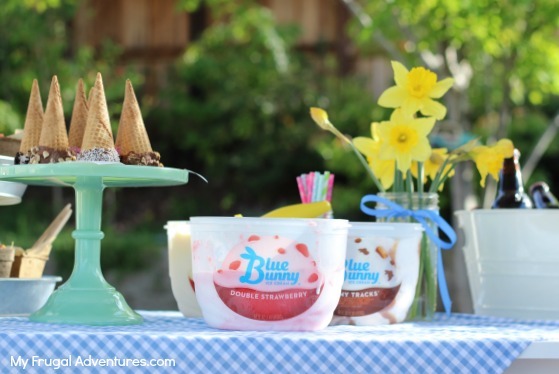 I picked upBlue Bunny® Ice Cream in three varieties at Walmart- Blue Bunny® Homemade Vanilla, Blue Bunny® Bunny Tracks® and Blue Bunny® Double Strawberry. 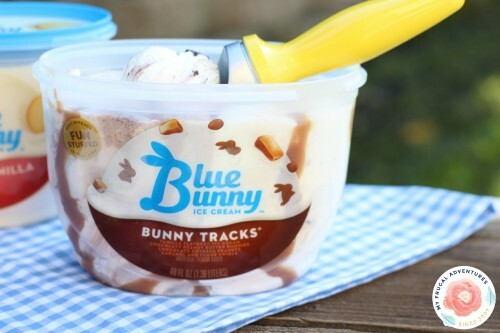 I like Blue Bunny® ice cream because they have a wide variety of flavors that are delicious. Plus the ice cream comes in this clear packaging that makes it so easy to see exactly what you will get- perfect for a party like this. Since the weather wasn’t too warm we just popped the containers right on the table and allowed people to grab the cone of their choice and then scoop the ice cream they wanted. The clear tubs made the process really fast because people didn’t need to stop and read what the flavors were. 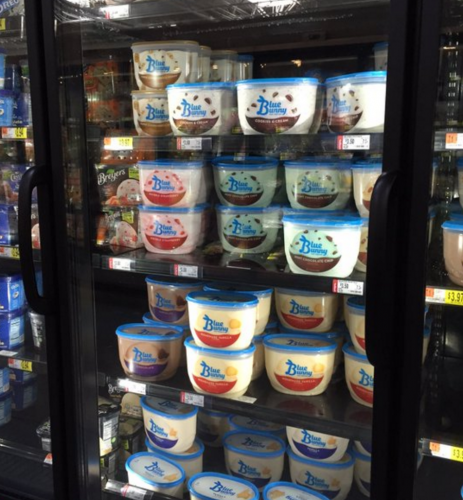 You can find about a zillion flavors in the ice cream section at Walmart. 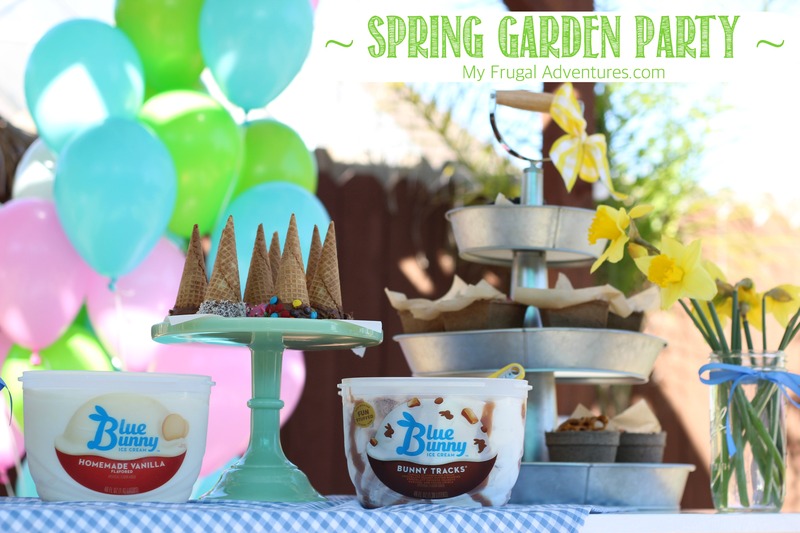 Here are some other combos I considered for the party: Milk Chocolate and Chocolate Sandwich Cookie cones with Blue Bunny® Mint Chocolate Chip, Milk Chocolate and Pretzel dipped cones with Blue Bunny® Salted Caramel Craze, White Chocolate and Graham Cracker cones with Blue Bunny® Cherrific Cheesecake. For a more grown up option what about a White Chocolate and Biscotti cone with Blue Bunny® Pistachio Almond ice cream? 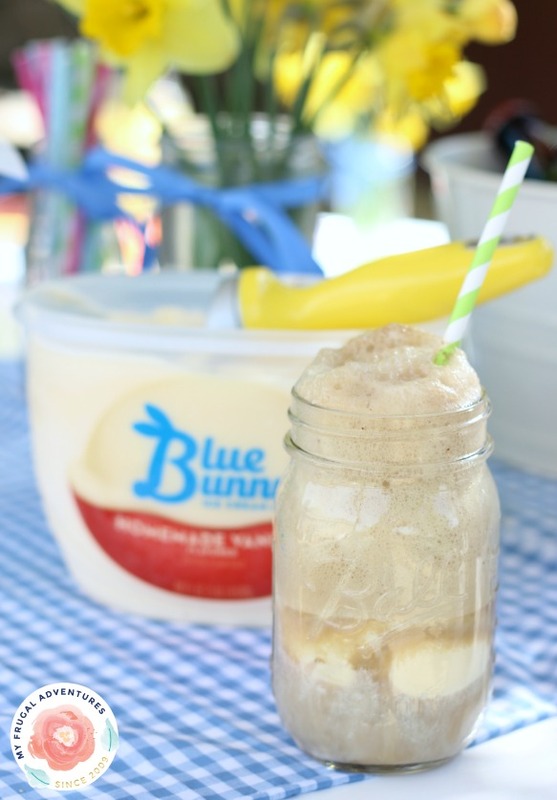 And one last option was Root Beer floats with the Blue Bunny® Homemade Vanilla- so yummy! 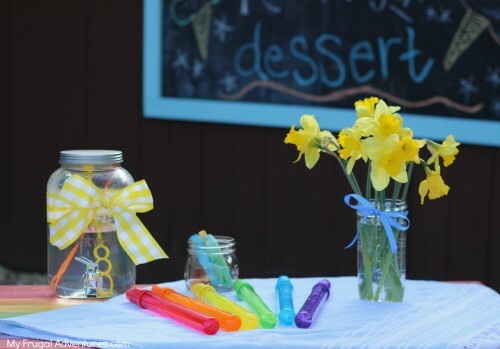 I wanted to keep things simple with decorations and activities-really the focus of the party was friends, delicious treats and the beautiful Spring weather. 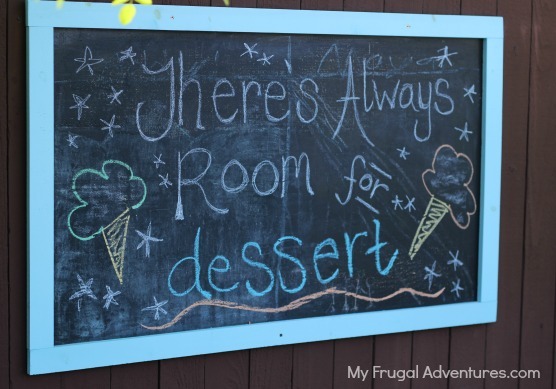 I started with a fun outdoor chalkboard for the kids- I drew a simple design on for the start of the party but by the end they were coloring and playing games and having a great time on the chalkboard. This one is pretty large about 6 feet long so plenty of room for several kids to color. I also set out bubbles – both wands and then all year round we keep a drink dispenser filled with refill bubbles in our backyard. My children find bubbles absolutely irresistible. 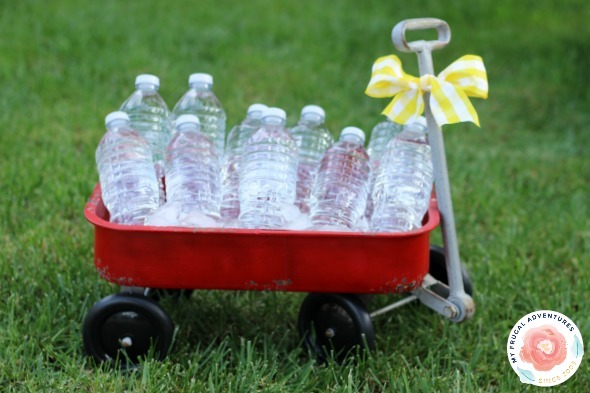 And a few other little details- we have a toy wagon that was perfect for holding water bottles. I love this thing and it was very charming as a cooler for water. 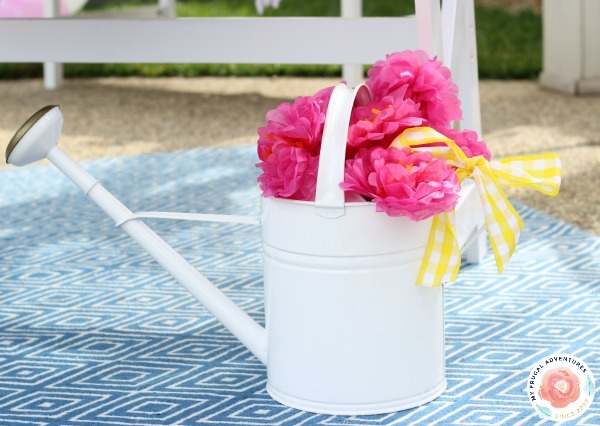 I had some simple vases of daffodils out but I wanted an extra pop of color so this white watering can was perfect filled with some paper flowers I grabbed out of my daughter’s room at the last minute. 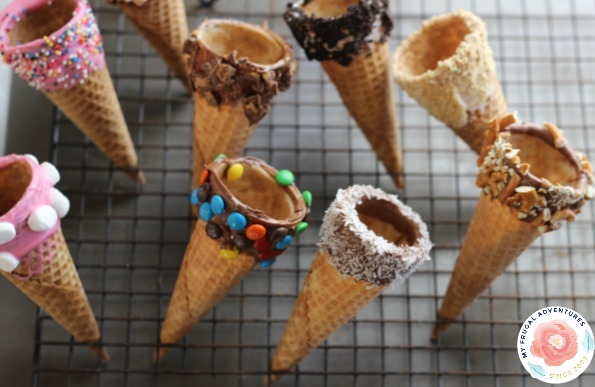 And to make the dipped cones couldn’t be easier. 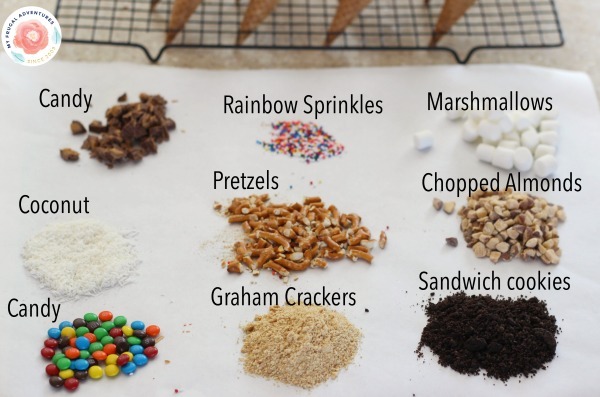 Just select a variety of toppings- I choose pretzels, almonds, coconut, candy, peanut butter cups, sprinkles and mini marshmallows. 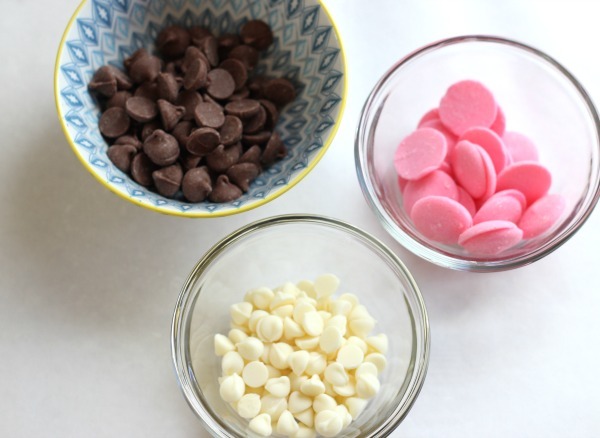 I also choose pink candy melts, white chocolate chips and milk chocolate chips. I made 12 cones in total so I only needed a small amount of each topping. I just laid it all out on wax paper to make a dipping assembly line. It is best to prep the toppings first and also have a space to set your dipped cones. A cookie cooling rack works beautifully to hold cones upright or just use wax paper to set the cones facedown. After I prepped the toppings, I found pink melting wafers and two varieties of chocolate chips. I melted each one in the microwave at 30 second intervals stirring well between each. If you have any issues with the white chocolate or chocolate chips seizing up or not melting well, try adding a small amount of coconut oil and stir well. That helps quite a bit. When I buy inexpensive chocolate chips I find I have a lot of issues but when I buy better quality products, they seem to melt perfectly. Next go ahead and dip the cones in the chocolate/candy wafers. 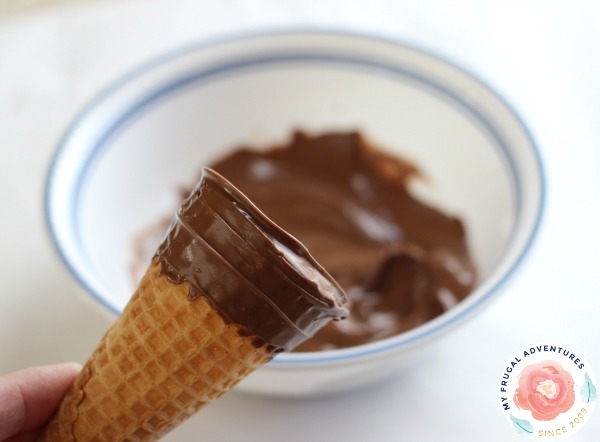 While the chocolate is still wet, go ahead and either dip the cone in your topping or just sprinkle it over the cone. And simply set aside for about 20 minutes for the chocolate to set. Depending on the temperature you can do this on the kitchen counter or on a warm day, pop these in the fridge to set. You can customize these to any party or theme you like! 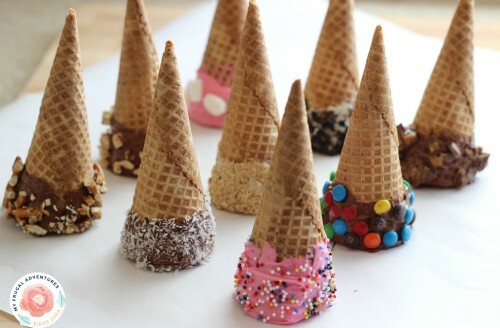 The pink cones are so cute for a little one’s birthday or I might make these again with white chocolate and red and blue sprinkles for 4th of July. Perfect with the Blue Bunny® Double Strawberry ice cream! If you decide to give this type of party a shot, please come back and let me know how it goes for you! I’d love to hear the flavor combinations you come up with! Check out Blue Bunny.com to see what your favorite flavor will be this Spring! I love this! It’s not spring for us yet (still snowing!) but this would be great for my daughters summer birthday! This is one of the reasons why I love your blog! You have such cute ideas that are not super expensive…not time consuming…and they turn out fantastic! I’m going to do this for a casual summer get together. Thank you for sharing. Oh thanks so much Dodi! I really appreciate that because you summarized the goal of the blog in like one sentence 🙂 I was so worried it would be weird without more food but we had people over at 2pm and it was just perfect. If I had grilled and made salads and such I think it would have been too much.